I'm a 3D artist that decided to create my own project in my spare time to free my creativity and personal ideas. I want to introduce the game we've been currently working on for the last year and a half . It's based on the Celtic Mythology. The idea was developed imagine a character is living in a Rubik's cube world, a world where every surface and floor is a tile of different "colour". 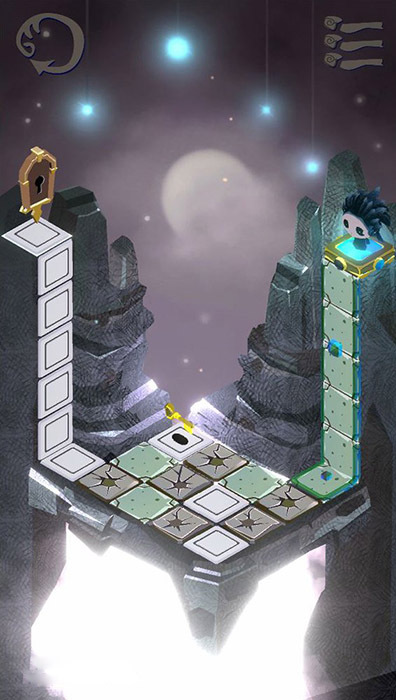 Players need to slide the tiles to create paths of the same "colour" . 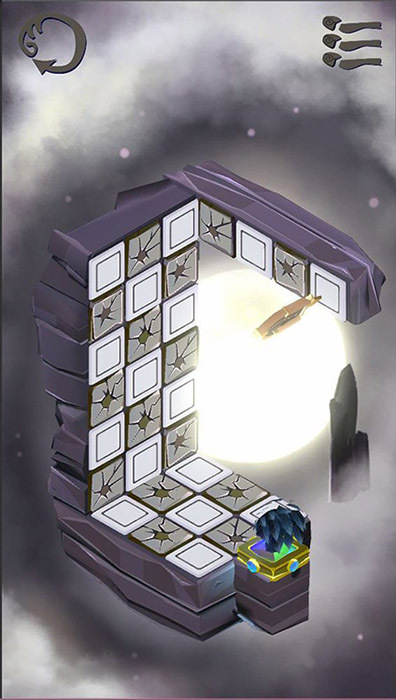 The path goes from flat tile to 3D when is all connected , so now the character can move and reach the dungeon exit. There are keys to pick up, fairies that activate magical totems, buttons to press that move/rotate the tiles, etc…. I use Zelda dungeons as inspiration, combined in a very tactile experience. The whole game is like a little mystery book full of secrets. Still lot of work to do, but is being a very fun journey. I will post updates here as we have some levels developed. I think would be interesting if I post here some of the initial ideas and sketches I've been through, so you can see all the creative process and how the idea was born. It took a while to get into this final art style and also get the core mechanics. Initially my brain was much more focus using "rubik cube" as a reference to build the gameplay (How would be living in a rubik cube world?). So everything was more clean, simple flat colors and geometric shapes. At some point, the developer asked me to create a story for the game, so I decided to theme the game in the Celtic mythology. The movie "Secret of Kells" became a good reference for the art visuals. At this point I also got the idea of all the game being presented like a book players need to read to see the story. All levels are presented like chapters of a magic book, and players need to solve at least 6 levels of 10 in each world to unlock the next chapter (blocked by a magic seal). Looking for more visual reference for the tiles texture, I found a good reference in the classic top view 2D Zelda games (Link to the past, Oracle of Seasons, etc...), and this open in my mind a new world of ideas for level desing and game mechanics. I started mixing the initial idea of geometric shapes and Rubik cube, with Zelda dungeons level desing. Adding keys, doors, enemies, switchers, fairies, etc... all the game started fitting much better all together. New update. Working on new mechanics and level design. We want each world to have new gameplay mechanics to surprise the players with new stuff. 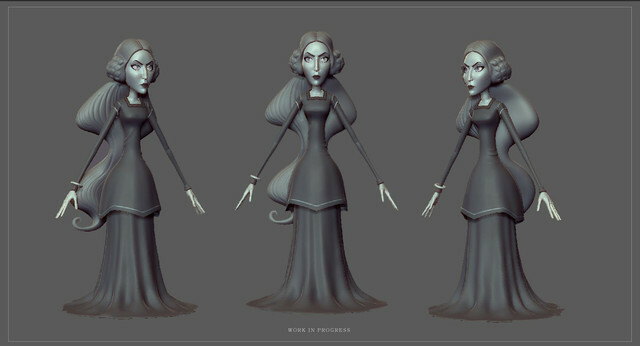 In this case is the "rotation mechanic"
Working on new world art (Crystal Palace), in level design and art style. To animate the Tiles I use a maxscript that I created. For the environment animations I use morph targets in 3D software , and then export the animated mesh. Encántame a música e as animacións, bo traballo! This looks sooooo friggin' cool! Really neat idea and gorgeous presentation, good work! Looking forward to seeing more. I'm working on levels with enemies now. Enemies can only walk in one color of tiles, and players need to slide tiles to create paths for them and bring them to the "enemy killer" item -red capsule placeholder-, that will kill them when they are close to it. Also, at the end of each world there is a boss. Here the gameplay is more arcade and is like a "chess match" between the two. Each boss has a different gameplay mechanic. I introduce you to Arianrhod, celtic goddess of fate and final boss of Crystal Palace world. I will keep updating next days with some level desing ideas and tests im currently working on. Hi guys!!! Many improvements in this last days. We have much more than what I show here but, is jut to show some ideas. Need to create: 3D animations for boss, visual effects for battle attacks (particles), 1 level more, boss level environment. Next world is FireWorld. I will start with concept art next week. Feedback,opinions and critics are welcome.